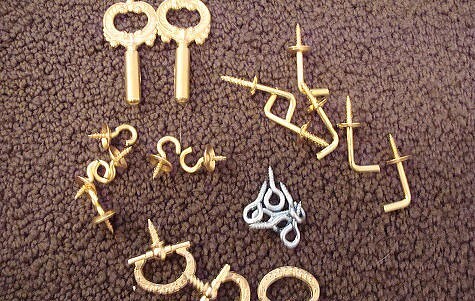 i’m the type of girl who has a real soft spot for earrings. bracelets and necklaces aren’t so much my thing but man can i collect some earrings (and a few cocktail rings). but inevitably i lose one of the pair and go searching throughout the house to find the little nook where my cats have hidden them. so last month when i saw blueprint’s fantastic story on creative jewelry storage i knew i had to try one of these. but when it came down to it i didn’t have drawers appropriate for the first project and the marble bust was a little too serious for me. so i figured the wine crate portion would be perfect. except that i didn’t have any wine crates handy so i looked around for what i did have handy. as it turned out i had a few extra ikea frames (the kind that are set in like shadowboxes) under our bed so i pulled them out and thought- perfect! the backs of each frame are just thick enough for the tiny screws so i went out to my local craft store and hardware store and picked up gift wrap and hooks that would be fun for the project (i also used printed paper from dwell‘s new promo notepad). blueprint painted their boxes a beautiful color to match the wrap but i’m pretty antsy so i decided to leave the frames a glossy white and let the gift wrap do the talking. for (many) more photos click here or “read more” below. for the full instructions (which work well with the frames, too) from blueprint click here. happy diy-ing! These are so great, Grace! I like the petite size, you can create little jewelry stories in each box and not get overwhelmed looking at your entire collection while trying to select pieces to wear. thanks robin! i had so much fun trying out different papers in the back. they’d be pretty easy to swap out, too. blueprint always has/had such great project ideas. Charming! I like how the jewelry becomes art. Love it! Especially since I have to admit I’m guilty of forgetting about all the wonderful accessories I have since they are locked up in boxes. I feel like seeing them everyday would be a great reminder to add a little shine to every outfit! I can’t see the pins you used to put up the earrings at all. Are they clear? the pins aren’t in yet for the photos after the jump. i only had 3 frames so i set up a few of them to hang on the wall and then just laid out the other to show different paper options. you can see the hooks and pins i used in the top photo, and the pins are in the last photo above, too. you just screw them in wherever you’d like. i find it helps to take a nail hole in first to get the screw started. this looks fantastic grace! hm, i have a left over Ikea frame that needs to be put to use and more jewelry lying around than I know what to do with. i’m not sure they’re available for sale, they were part of a press kit i received. you could shoot them a line and ask for one, it couldn’t hurt. These are great – I too have been trying to figure out how to cleverly and easily store my jewelry. I think I know what my weekend project will look like! love this grace! looks wonderful! 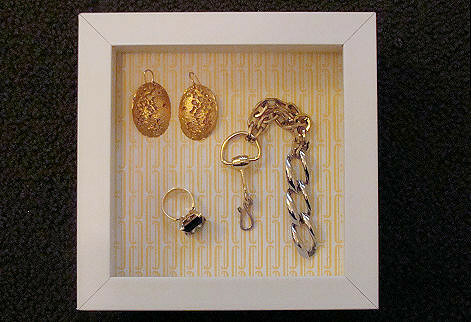 i can’t decide what i like best…the shadowboxes or your jewels!!!!! That was my FAVORITE project from the last Blueprint! These look fantastic, and now I’m even more inspired to make some for my shop. I tried this project after I saw the article in blueprint too. But, I didn’t have as nice as your screw hooks! I love the ones that look like keys. I did something very similar for my store, but I just used black felt and walpaper on the inside edges only. I think for spring I’ll switch them up with some pattern in the back. The only problem I found for using them in our store is that sometimes the patterned background distracts too much from the jewelry, since we’re trying to sell them, not just enjoy a personal collection. The first two pattern you used could work for my store though…. now to find something similar! What a great post! 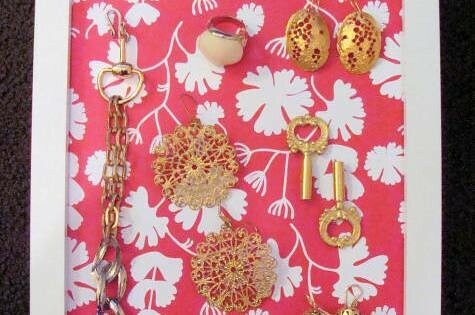 This has me truly inspired to create a jewelry wall-collage. And I was looking for an excuse to go to ikea. Could be interesting to create your own papers to use as the backdrop (say, digital prints of ((own)) artwork or an interesting photograph. where did you get this jewlery from? i love the gold one with the spots especially. everything looks so pretty!! I did this project, too! I don’t know if these photos will showup, but let me try, and please remove the post if they don’t. the earrings with the spots are by alexis bittar. the bracelet with the links is by mollie dash. This is one of my fav projects to do when I have a little time– I did a tutorial last Septempber very similar to this one but with fabric instead. i bought an excess of frames from good will for a project with cork (i needed a place for notes at my desk); now i know what to do with the extras! using the nice wrapping paper as a background is a wonderful idea. 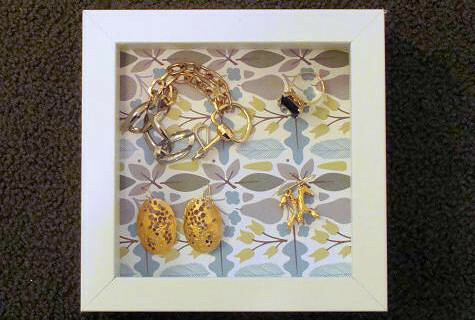 i’m going to try this with larger, antique frames i have tucked away! grace, this is fantastic! i have so many frames lying around that need jobs…thanks for the fabulous idea! Grace, could I really find the more decorative hooks at any hardware store? I love the pretty swivel hooks! This is a great idea. I love how yours came out. I hope that you don’t mind that I shared your idea on my blog (with credit to your truly of course). What a neat surprise this was! I was in the middle of going back through your DIY archives and came across these jewelry boxes. I scrolled down and saw a link to the original story in Blueprint (may it rest in piece :( ), which I actually wrote! I had so much fun learning how to make the shadow box that was featured. :)Anyway, just wanted to say how neat it was see it on your blog. Thanks! Great project. And yes, where did you get the pretty hooks. I don’t remember seeing them the last time I was at Home Depot! grace, you are probably not even reading this thread anymore, but – i just bought a ton of ikea bas frames, and the one big hitch i can see is that they’re constructed in such a way that removing the clear plastic front is nearly impossible. are yours just behind the glass? it strikes me that if i do this with my jewelry, it will be more decorative, but no more accessible than it currently is (stashed in a clutch purse after too many moves in too little time) and i still won’t wear it! Love this idea, i ahev way too much earrings and things, so i got three long pieces of wood, painted them and hammered nails in them to hold my jewerally. looks awesome, and its very useful! here you are again! I found your post when searching for the ranking on mine! I made a version of this last night with my husband! Turned out great! GREAT MINDS!!! Wow! what great ideas for just about everything. So glad I found your website. I feel like I have found treasure. The link for blueprint’s instructions for shadow box leads to Martha STewart…would love to see the original post at Blueprint…can you help?